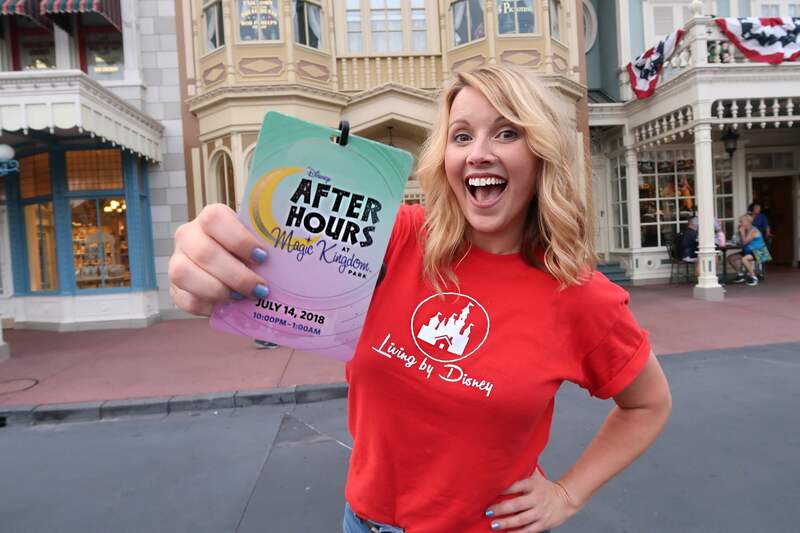 I’m so excited to tell you guys all the details about Disney After Hours so you can decide if it’s something you might want to attend on your next Disney vacation. Disney did invite me to come to this event, so I didn’t have to buy my ticket, but all opinions are my own and I’ll tell you if I feel it’s worth the money. Disney After Hours special event ticket that anyone can buy. It’s only offered seasonally and not in connection with any type of holiday events. You get three hours after closing time to have the park to yourself. It’s basically giving you the regular Magic Kingdom experience, but with an extremely small crowd level. How small? I was told (unofficially) it’s limited to 3000 guests. Considering Magic Kingdom averages over 50,000 guests each day and you can see why that’s an incredibly small number. It’s $120 a person, they do take Passholder and DVC discounts. It’s a stand-alone event ticket, meaning you don’t need an additional park ticket along with it. If you buy your tickets separately, then this could be a day you don’t purchase a park ticket, and maybe take this day to rest, enjoy resort time, or visit Disney Springs. If you have your tickets as part of a Disney vacation package, then your tickets are probably “length of stay” meaning they’ll cover each day of your trip. In that case, you could decide to purchase this event on top of those, and you’d still be able to access the park during the day with your regular vacation package tickets. And, if you’re a Passholder, the ticket will run you about $100 plus tax. Right now, Disney has this scheduled for just a few select days into September 2018. No word on 2019, but last year they had Disney After Hours during January and February so they may decide to do that again. Update: Dates have been scheduled into April of 2019 so far. If the event continues to get positive feedback it’s likely to be offered beyond those dates as well. Check here for all the dates available to book right now. The event is obviously “after hours” so it happens after Magic Kingdom closes. On the night we attended the hours were 10pm-1am giving you three hours of almost empty park time. However, they let you enter the park as early as 7 pm, which is great because that gives you the chance to see the fireworks or the projection show or any other normal park activities you’d like to do before the party officially begins. Since the park is closing a little early (10 pm) for regular guests, many people already know they won’t be staying late so the vast majority of guests clear out as soon as Happily Ever After fireworks are done. Meaning even from 9-10pm the crowds were far lighter than normal. You can still see the Fireworks before the party officially starts. Most of the Magic Kingdom’s attractions stay open and available for you to enjoy for the event. The other huge bonus: during the event (from 10-1) you get unlimited bottled drinks, popcorn, and ice cream bars. This includes any of the ice cream bars sold in the little kiosks including everyone’s favorite: Mickey Bars. As many Mickey Bars as you can eat. Also included: They station Photopass photographers around the castle and all down Main Street during the event, as well as inside all the character meets. Liberty Square snack cart during the event. In a word, yes. I wasn’t 100 percent sold on this event since I feel like you can enjoy the park with lower crowds any time if you’re willing to stay very late to do so. And while that’s true, I was comparing the crowd levels to other special ticket event parties like Mickey’s Halloween Party or Mickey’s Very Merry Christmas Party. Those parties have lower crowds than a normal park day, (especially during holiday times) but this is an entirely different thing. This isn’t just low crowds. It’s like having the park almost to yourself. It’s a true VIP experience. You feel like someone rented out the whole park and only invited a few people to come to play. Most of us would agree that the thing that causes the most frustration when you’re at Disney is crowds. Congestion of people, long wait times for everything, and feeling overwhelmed by the struggle of navigating through people all day long. This completely removes all of that. So what does that mean? It means nothing over a 10-minute wait. Yes, even Mine Train. Even Peter Pan. I mean, these rides open with long waits. I’ve never, in all my visits to the Magic Kingdom, seen them be a walk-on ride. Peter Pan lists 10 minutes but it was actually even less! It also means that even though it’s only three hours of park time, those three hours are like gold. You’re going to cover more attractions in three hours than you would in two whole days otherwise. And that, bottom line, is why I feel like this ticket price is completely worth every penny. It’s ideal for people who really want to hit those rides. Who aren’t as much about the shows and entertainment as they are about checking those attractions off their list. It’s maybe not as suited for families with very young children who would struggle to stay up that late or would be over stimulated with going from ride-to-ride so quickly with no downtime in between. These may want to consider the holiday parties as they will still give you lower crowds, but they also give you lots of other entertainment in the park and don’t last quite so late. They don’t offer special or rare characters during Disney After Hours, it’s not an event that’s about new entertainment, it’s more about experiencing all the regular Magic Kingdom attractions with little or no waiting. My experience was an absolute blast! In the first hour of the party, I rode Pooh, Peter Pan, Peoplemover, Haunted Mansion and Space Mountain. All of that in one hour. That would have taken all day to do in a normal park day. I also visited Mickey Mouse on my way out at the end of the evening and I had him all to myself. It was the best! This is also the ideal time to get those empty Main Street shots, or of you in front of the castle with no one else in the shot. Those are iconic and some would feel are worth the price alone. Note: Big thanks to Cliff Wang for snapping some pics of me with an empty park. These were taken right around midnight. To check out Cliff’s awesome photography, follow him on Instagram. I know many of you on social media have already reached out to me saying you’ve booked the event after watching my stories and posts so if you do go, make sure and tag me in your pics, or let me know what you thought. I’d love to hear about your experience. Thanks to Disney media for the complimentary ticket! I would definitely go again on my own without a doubt.